Passwords are the primary, most widely used single sign-on and multiple point authentication scheme adapted across the globe. 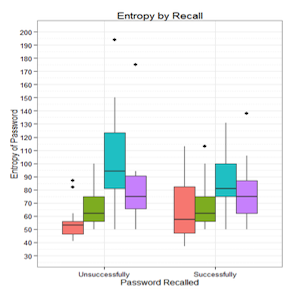 Our research looks at not only how people create and use passwords, but also at external factors that may influence their behavior, such as to what extent changes in password policies and in system requirements impact password usage and reuse. Despite calls for the death of passwords decades ago, passwords continue to persist as they are still the cheapest and simplest authentication method to implement for a company or organization. Regardless of the widespread use of passwords, most people still find them difficult and frustrating as they get in the way of users doing whatever task it is they are wanting to accomplish. Many people develop coping strategies when dealing with passwords that commonly results in using password managers, reusing passwords on multiple sites, writing them down, or creating standard formulas for password creation. People still continue to have difficulty in creating strong passwords that they can recall and use without using various coping strategies. But even if they follow best practices and create extremely strong passwords, it does not ensure that their account is safe or free from the risk of their information being unprotected. News of companies and organizations having their security breached or implementing a security measure improperly have almost become so common that many may miss or ignore the news of their data being leaked and their password exposed. Therefore passwords are not simply something that users need to worry about, but it should also be a concern to companies and corporations that implement the systems and requirements.